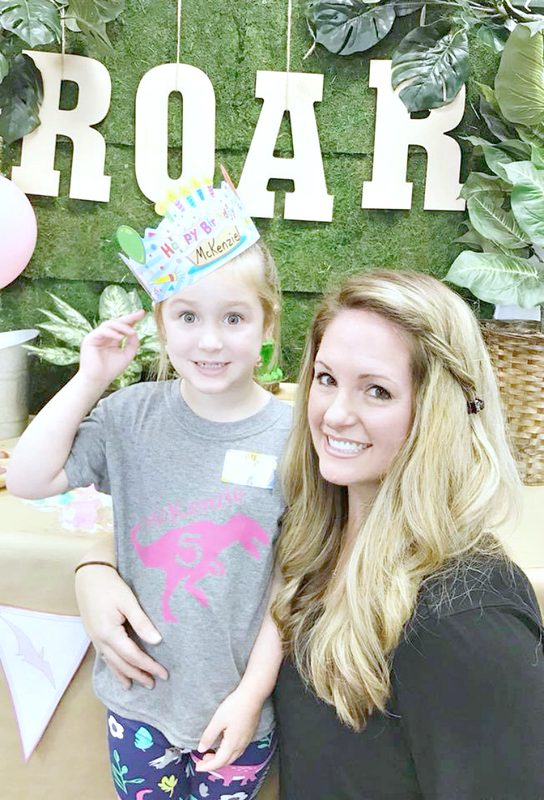 It's hard to believe that I am writing this blog post in regards to our little baby girl turning 5. It feels like yesterday that I wrote A Love Letter to her when she turned ONE. My how time flies when you're having fun! Parenting is hard work but I have to admit - It's so much fun! I mean after all the late night feedings during the newborn stage and the tantrums that begin around 2, there are those moments that you see their face light up in awe at you that makes all of the not-so- fun times seem not that terrible. Especially when they hit the age of 5. Their ideas, their dreams and thoughts become much clearer and a lot more loud and clear so when you as a parent can bring those ideas, dreams and thoughts to life - well, It's Just Fun! 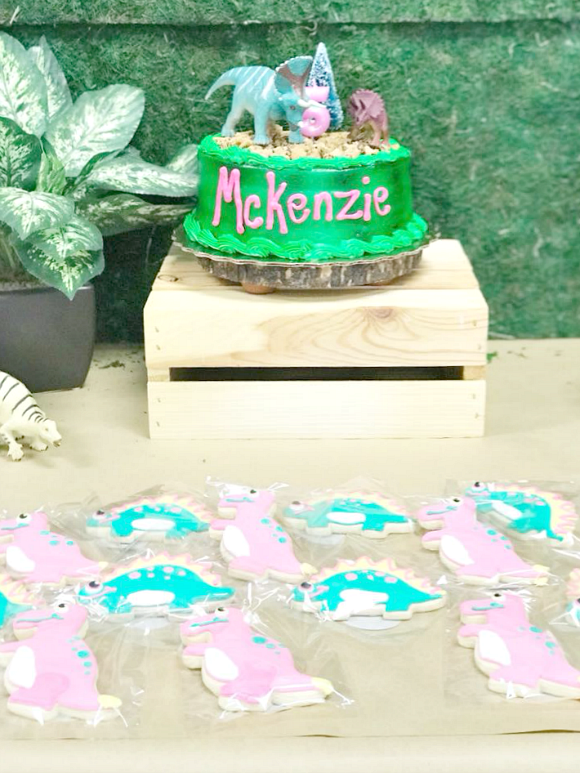 As many of you know, McKenzie didn't quite grow up to be the doll lovin', playing house kind of little girl that most of us were expecting. In fact, her interest are quite the opposite. Her newly found passion are those of the Pre-Historic Time Period - Dinosaurs! When I say "Passion", what I really mean by that is "OBESSION"! I'm talking full blown obsession - to the point that Ryan and I are learning more from her than she is from us. 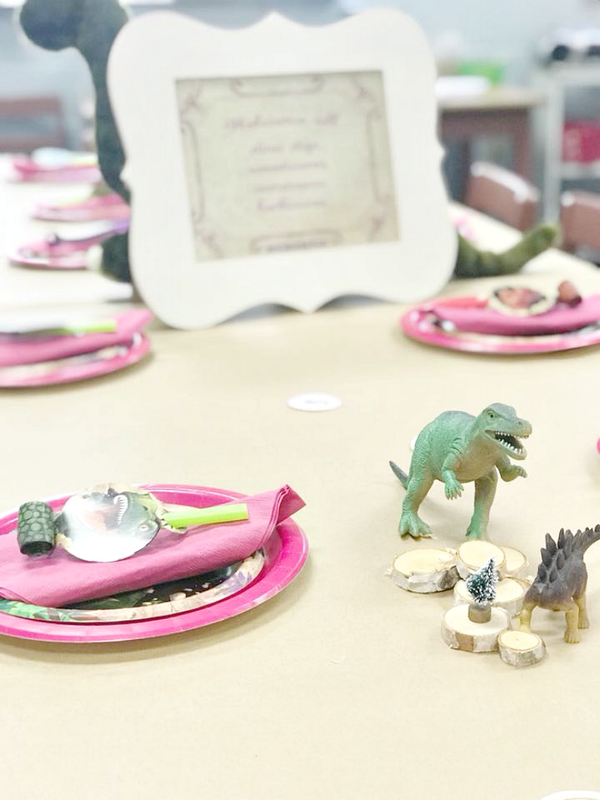 We literally feel like we are talking to a full grown adult dinosaur specialist, thanks to shows like Dino Dan, Dino Dana & Dinosaur Train! 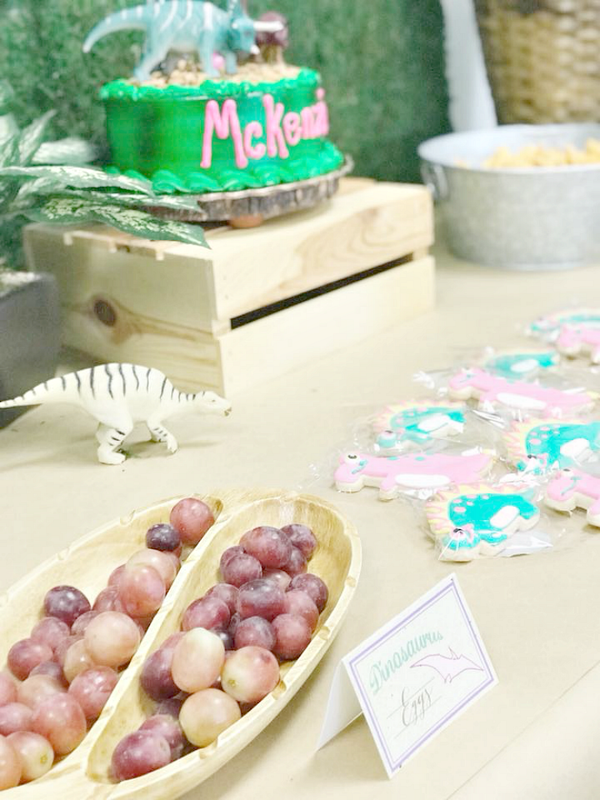 So of course this year we went all out for her celebratory class snack birthday party. 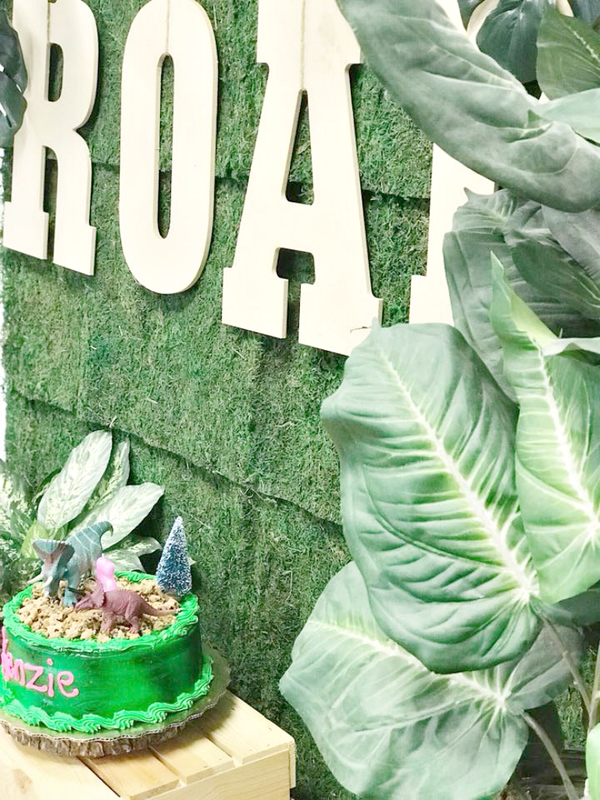 Because I tend to "over do it" with our kid's birthday celebrations, I compromised with my husband and agreed that we would plan big birthday parties every other year and smaller scale "just family" celebrations for the years in between. 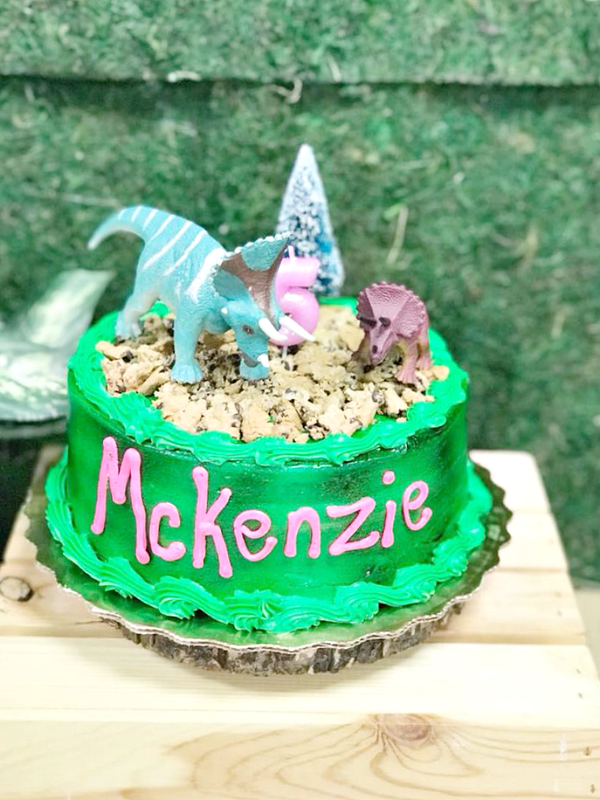 Well you can imagine the predicament we were in when she came to us saying how excited she was to have "A DINO BIRTHDAY PARTY" this year. 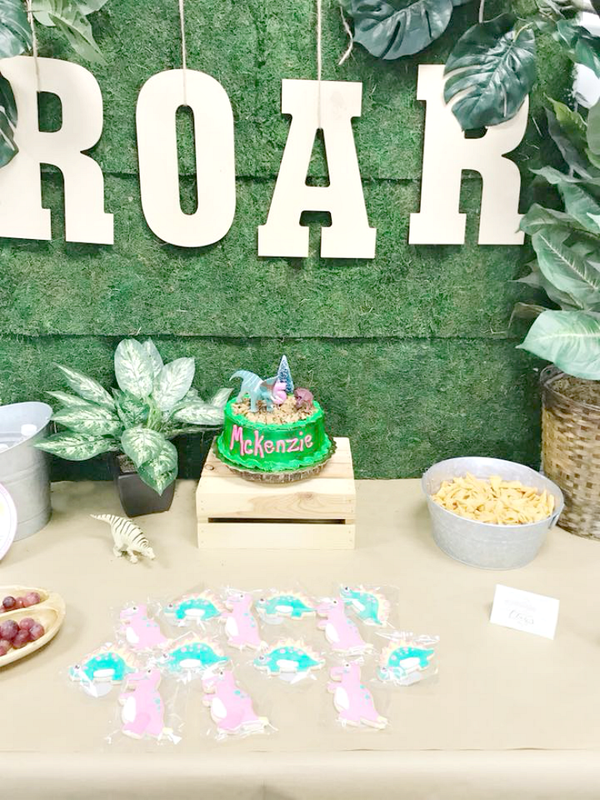 Since this birthday fell on a "small scale" year (see our Peppa Pig Party last year here), I decided to use her class birthday snack as a way to kill two birds with one stone. Of course I do what I always do best and go to Pinterest for ideas. 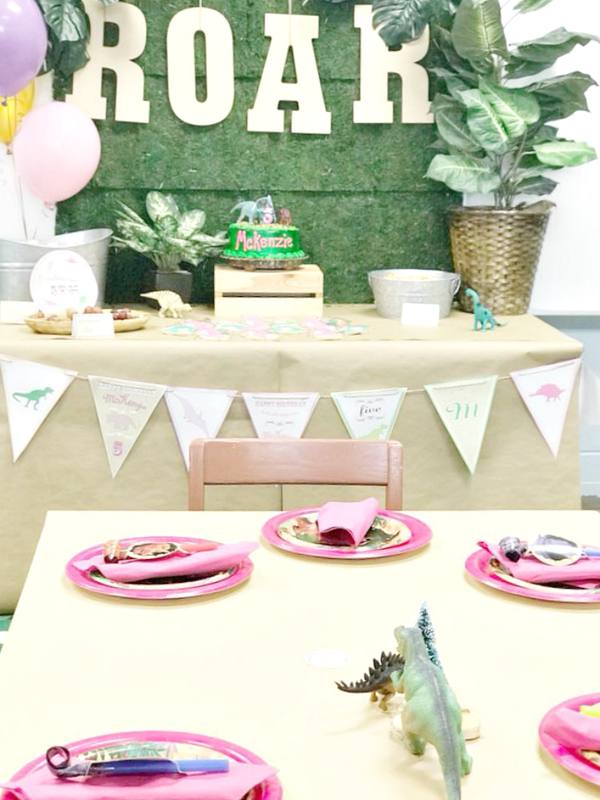 Since she's not really an All Pink Everything kind of little girl, I went with the more realistic Jurassic look for the decor and threw in a pop of Pink in the cookies and paper plates. I then created a backdrop using a thick poster board covered with Moss from Michaels. I used Palm Leaves to frame it and other artificial plants I had sitting around the house. 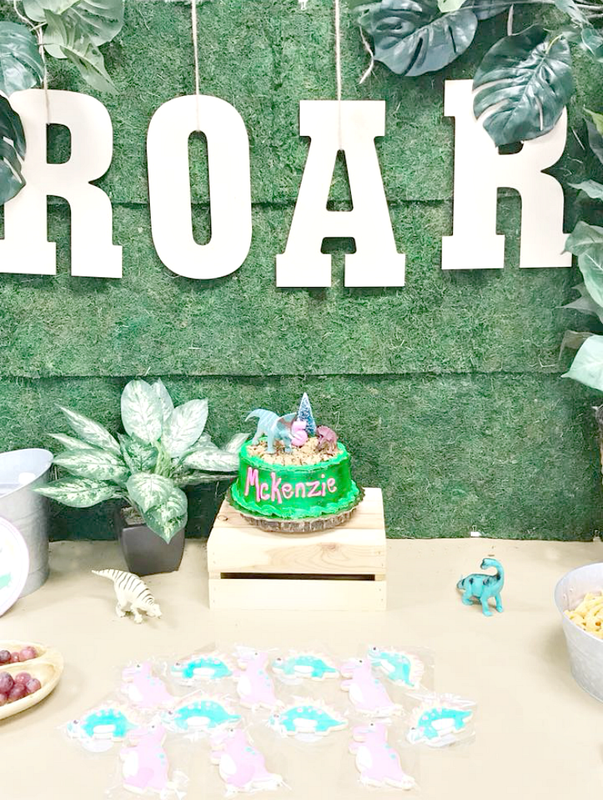 I purchased wooden letters that spelled out "Roar" from Hobby Lobby and hung them using twine to set the stage for the rest of the cake table. I purchased our cake from our local grocery store Publix. 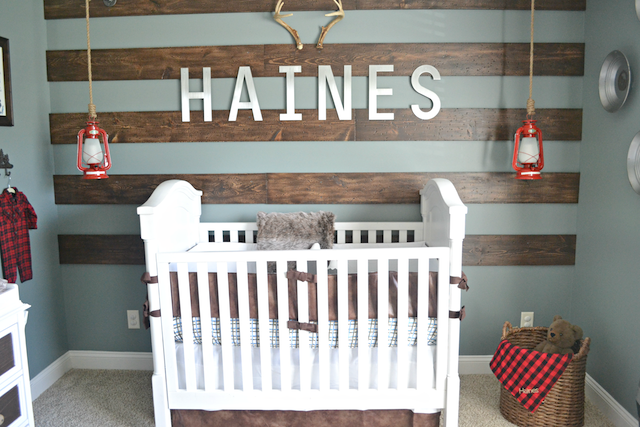 They always do such a great job and are reasonably priced. 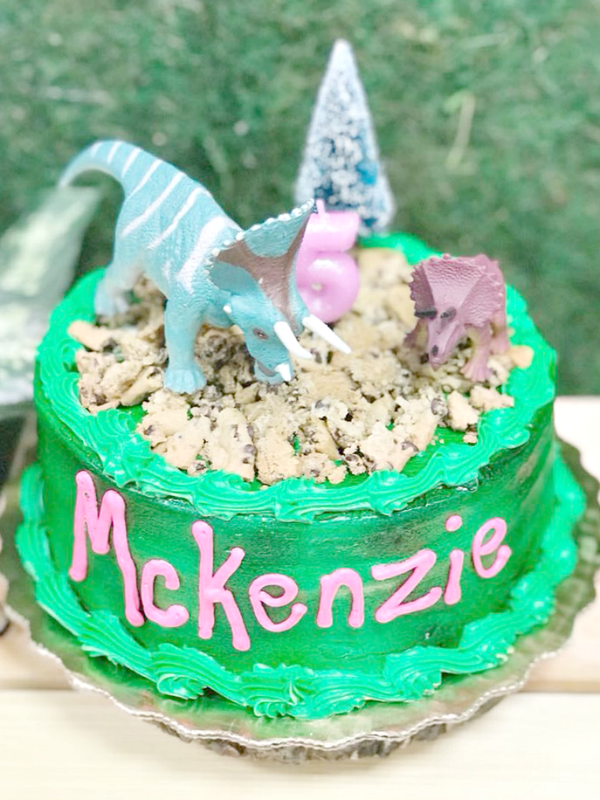 I simply added a number 5 candle and dinosaurs that we had plenty of in every square inch of McKenzie's room. Since this was just snack time. 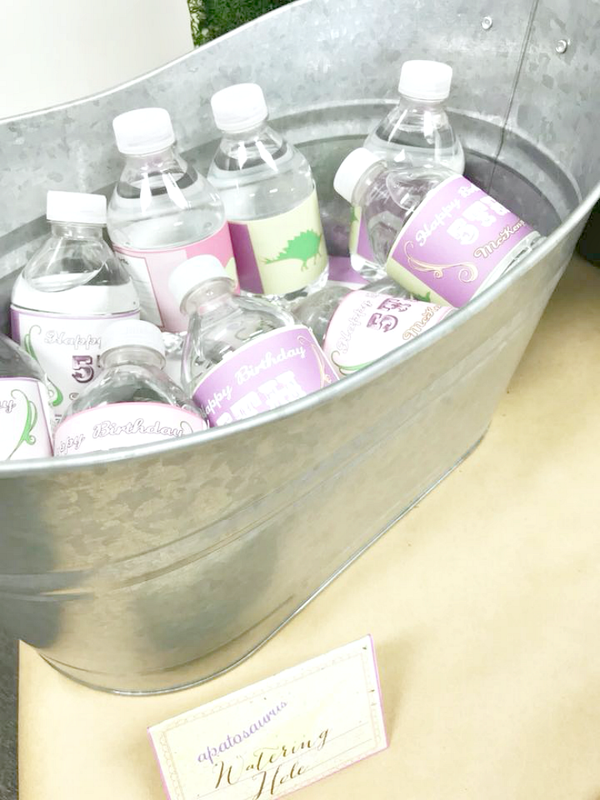 I offered the kiddos a bucket of Buggles as "Triceratops Claws" , Grapes as "Dinosaur Eggs" & Green Hawaiian Punch as "Prehistoric Punch" as well as mini bottled waters. 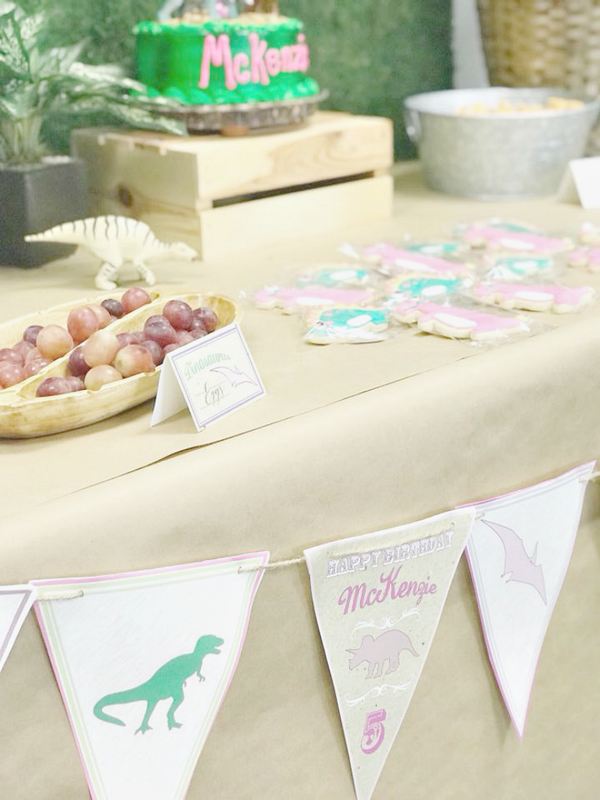 The adorable party printables are from Etsy Shop, "Sweet Papermint". 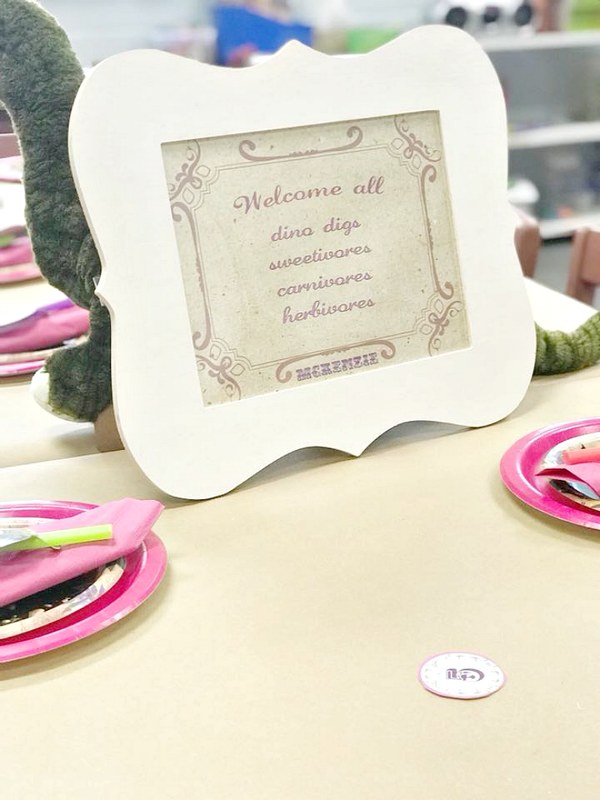 Shop owner, Marsha has the cutest printables in every theme imaginable. 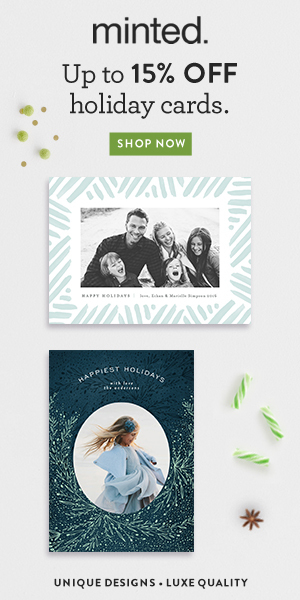 She is wonderful to work with and her files are crisp and clear and are so easy to download and print from your home computer. 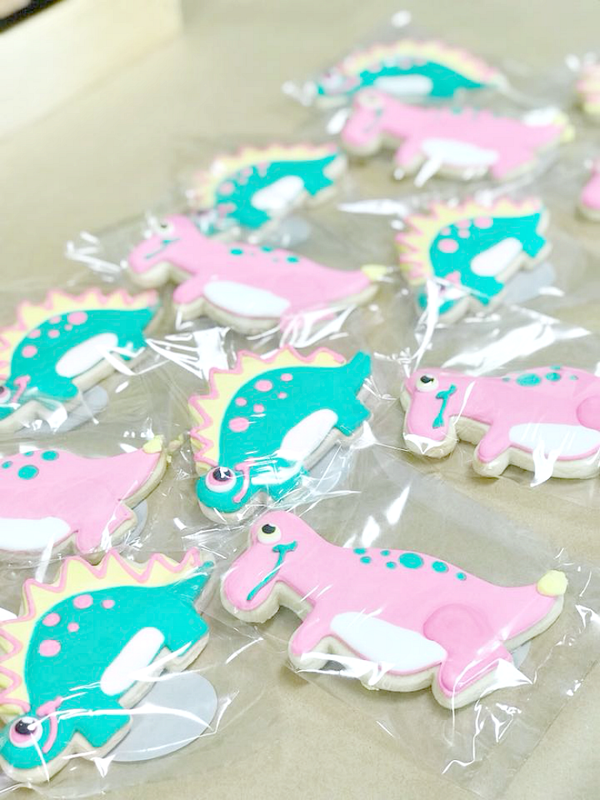 These sweet Dinosaur sugar cookies are from a local baker here in town called Sweet Addiction's Bakery. 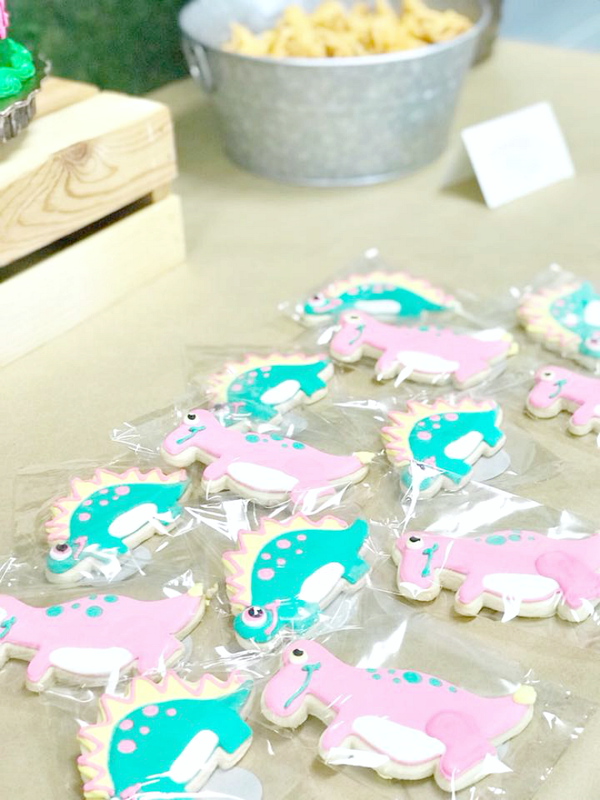 They create the most adorable themed cookies for every occasion. 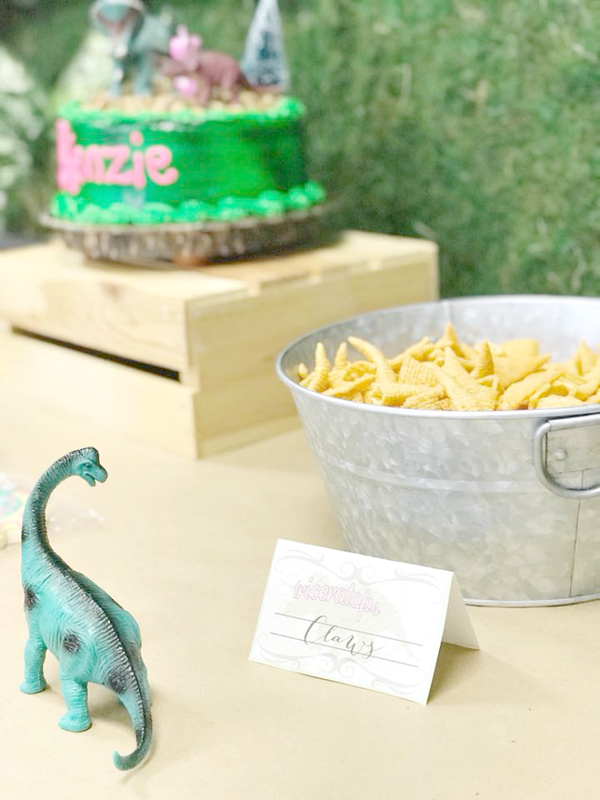 See more examples here at our son's 2nd birthday party. 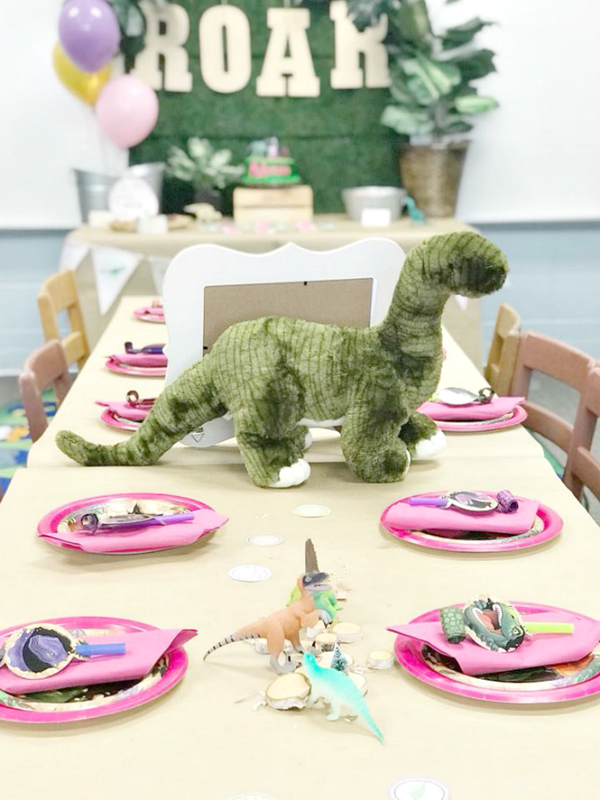 I set up a long table for the kids to sit at and I simply topped it with kraft wrapping paper along with bright pink paper plates and dinosaur themed cake plates and party blowers. 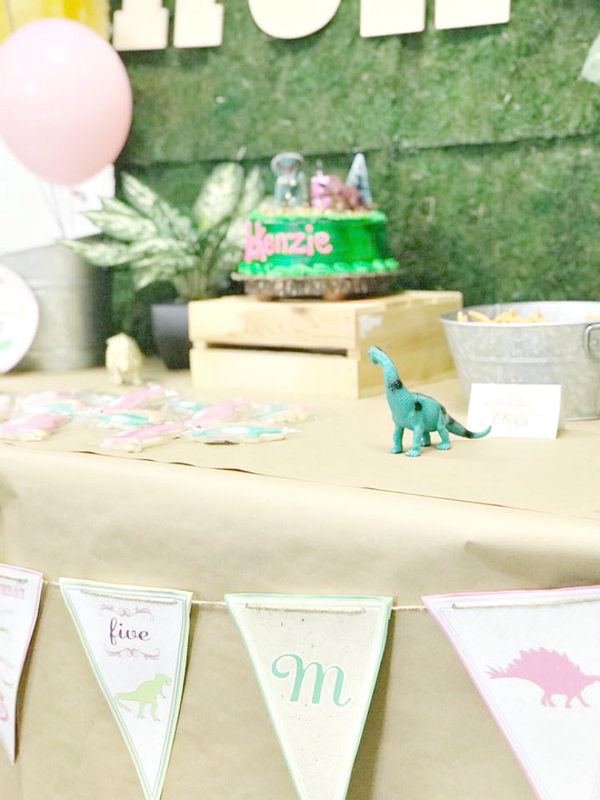 For the centerpiece, I used dino figurines, a large plush dino from home and framed a cute welcome sign from Etsy Shop, Sweet Papermint! She was amazed when she walked in with her class and could not stop talking about it the rest of the week! It's moments like these that make me step back for a minute and appreciate how much fun mom'ing can be! Happy Birthday To Our Precious Girl!